Please contact your local shelter if you have lost/found a dog. If you turn the pet over to a shelter, animal control, or rescue AFTER you have registered the pet with us, please use this link to IMMEDIATLEY update the dog to "Surrendered". Include the name of the shelter, their address and phone number, and the Animal ID # assigned to the dog by the shelter. www.HelpingLostPets.com/MyPets. Not alerting us immediately may endanger the dog's life! It's critical that the owner knows to contact the shelter directly and isn't delayed by trying to reach you instead! They need to contact the shelter as soon as possible. Each day their dog is at the shelter they are charged fees. Some owners aren't able to come up with the money immediately and each day costs more. Higher fees may prevent the owner from reclaiming their dog, resulting in the dog being placed for adoption or euthanized. If the dog's family doesn't realize you no longer have their dog, the dog may be euthanized while the owner is trying to contact you! Shelter only holds pets for a few days, if for some reason the owner is unable to reach you, any delay could mean the dog was adopted to a new family (permanently) or even possibly euthanized. Please update immediately, as even one day could mean life or death for the animal if they aren’t reclaimed by their family in time! Take the dog to your local shelter and fill out the necessary paperwork. The shelter is the first place people check when they lose their pet, so it's very important that you take them there. 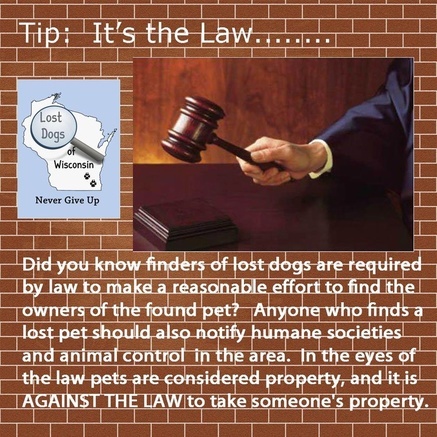 You are legally required to contact the shelter, police, and/or animal control when you find a lost pet! Depending on the regulations at your particular shelter, you may not have to leave them there. Hopefully, the dog is microchipped and the owner can be easily contacted. In the state of Florida pets are considered property and it's illegal to keep or find a new home for them without contacting your shelter, and taking the proper steps to find the original owner. Most lost dogs don’t need a new home, they need help getting back home! Please use a clear photo that shows the dog’s entire body, face, and any unusual features or markings too. Use the very best photo possible! A good photo may be the difference between someone recognizing the dog and it being reunited with their family, or not. There are many volunteers who help by comparing photos of dogs reported as missing to those that are found to make matches. It's important that they are able to see these identifying traits in photos. If you have several photos that show the dog from different angles, you can use Pixlar Express to create a collage. ​If you find a lost pet at a time when the shelter is closed, take them to a 24 hour emergency clinic to be scanned for a microchip. Ask if they have a universal scanner. Some brands of microchips may not show up unless read by this type of scanner. This makes it appear as if the pet does not have a microchip – even if they really do. It would be a shame for a family not to find their pet because the microchip was missed! Shelters typically have universal scanners that read ALL brands of microchips, but a veterinarian may not, so it's best to have them scanned at a shelter again when they reopen if there was no chip read at the vet’s office. If the dog has a microchip, the shelter/clinic will be able to help you reach the owner. Ask if there are additional phone numbers listed as back-up on the microchip, and also who implanted the chip. Is there a secondary registration? The person scanning the dog may not be aware to ask this (vet staff or shelter staff), so pass this information along to them. If the microchip hasn't been registered, or the phone number is no longer in service, click here for help from the Microchip Hunters. Lost Dogs of America and Helping Lost Pets has a team of volunteers who are available to help you, your shelter, or veterinary clinic track down the owner of the pet using the chip number. This is completely free. Many reunions have been made through this service that may not have been made without their help! Please inform your shelter and veterinarian of this free service. If you need to keep the dog in your home until the shelter reopens, keep them safely confined in a spare bedroom/bathroom or a securely fenced back yard until the shelter reopens -- secure being the key word. You probably have a four-legged Houdini on your hands, who has already escaped once! If you aren't able to take them to your own house, ask a friend or relative if they can keep them temporarily. Flyers are the most effective way of reuniting a lost pet! Go door to door and leave a flyer. Download FREE flyers here. Place them in the area you found the dog, and pet related businesses such as vet's offices, pet stores, etc. Post in places where people walk, and near schools where children will see them -- kids are observant. Use brightly colored neon poster board to create Found Dog signs to post at intersections. Place them where cars will be stopped long enough to read them, but be sure they're readable from a distance. They should be easily readable from the driver's seat of a car driving past without slowing down. Newspaper - Most papers will allow you to place a free ad. List of Florida newspapers. Don’t be afraid to provide a picture and information. There are many caring people who monitor Craigslist and social media to help reunite lost pets with their families by matching pictures/locations/and other details. If you are worried about someone trying to claim a pet that isn't theirs, ask them to provide photos of the dog as proof of ownership. It’s a good idea to meet the possible owner in a public location such as your local shelter. If you are unsure whether they’re truly the owner, or have questions about the safety or care of the dog, you can surrender the dog to the shelter, and the owner can reclaim their pet after speaking to shelter staff or an animal control officer. ​Put the dog on a leash and for a walk - often they will go straight home! Ask people you meet if they recognize the dog or know where he/she lives. Do not have the dog groomed or alter their appearance, as this can drastically change the way they look, making it less likely for them to be recognized by their family or people who are helping to look for them. Many volunteers help to look for possible matches. This will make it difficult for them, or even their family, to recognize them. Talk to kids in the neighborhood. They spend more time outside and can often know which house a dog is from. Go to the bus stop in the morning with a flyer. Social media works! Social media is very effective, but we need your help! Watch for comments on the Lost Dogs Florida Facebook page under the your flyer on our page, and also monitor the Visitor Post section on our page. The dog's owner may post there. Many reunions are made this way. To tag yourself: Go to your dog’s photo and click onto the photo; then click Tag This Photo. Enter your name and then press enter. Then click Done Tagging. Facebook will notify you when a new comment is made under your flyer. While we try to monitor these posts, we simply don't have enough volunteers to keep up. You are responsible for watching for these comments. Also check your e-mail regularly (spam box too) for comments generated through the Helping Lost Pets system. All of the dogs listed with us are posted to Pinterest, Twitter, and Facebook. Don't rely solely on Facebook. The dog's owner may not use a computer. Place a large sign out in your front yard (or where you found the dog) that says FOUND DOG and your phone number. It should be easily readable from the driver's seat of a car driving past without slowing down. The dog's family may drive the neighborhood, searching for their dog. We will send alerts to members who have signed up to receive notifications of lost and found pets in their area through our partner Helping Lost Pets. To help reunite lost pets in your neighborhood, sign up for alerts for pets lost/found within a 3 mile radius of your home: www.HelpingLostPets.com/Alerts. Please exhaust all efforts to reunite the dog with his family. Someone may be desperately searching for him. He may be an elderly person's only companion or a child's best friend. Think how you would feel if your dog was lost. To make sure you’re returning the dog to the rightful owner: When someone comes forward to claim them check to make sure they're really the owner. Do they have a picture of the dog? Can they describe something about the dog that didn’t show on your flyer, such as collar color, an unusual feature, a scar, etc. Unfortunately, someone might try to claim a dog that isn’t theirs. You want to make sure that you're giving them to the right person, so they get back safely to their family! Their fate is in your hands! ​After you have reunited the dog with the owner: Please use this link to update the pet’s status: Back home! This allows our volunteers to focus their efforts to help other lost pets. We appreciate details on how the dog was reunited as this helps us gather information about which strategies are most successful. We use this to develop better methods for finding other pets and share this with shelters, rescues, and animal control facilities. Need more help? If you have questions or we can help in any way, please let us know. Lost Dogs Florida is an all-volunteer group dedicated to reuniting lost dogs with their families. This service is provided free to dog owners, shelters/rescues, and animal control professionals. - Increase awareness that often a lost dog doesn't need a new home; they just need help getting back home! Would you like to join our team? Volunteer from home. All you need is a computer. We'll provide training. More info. Thank you to Lost Dogs of America for the photo tips. Note: Any advice or suggestion made by Lost Dogs Florida is not paid-for professional advice and should be taken at your discretion.